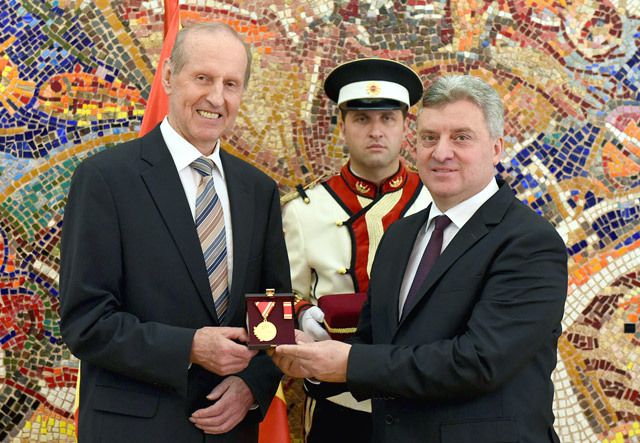 The President of the Republic of Macedonia, Dr. Gjorge Ivanov decorated Prof. Dr. Heinz Brandl, Austrian Geotechnical Engineer, with Medal of Merit for Macedonia. The professor was decorated for the exceptional results in his long-term engagement in the development of engineering, science and education in the Republic of Macedonia, thus making a significant contribution to the affirmation of the Republic of Macedonia in the world. Medal of Merit for Macedonia is awarded to individuals and legal entities for the development and promotion in all areas of life and work in the country.